Representatives from Webb County and Schneider Electric don hard hats at a construction kick-off event on October 30, 2017. We believe that everyone in Webb County should have an opportunity to realize their own energy savings. 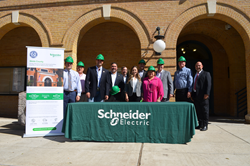 Energy and sustainability expert Schneider Electric today announced the start of construction on an innovative energy efficiency project with Webb County, Texas. The project will improve the County’s aging facilities and deliver significant energy and operational savings. The project is designed to leverage savings from Webb County’s energy budget to fund much-needed infrastructure upgrades and improve quality of operations. For years, Webb County faced a growing list of deferred maintenance projects that drove high operational costs. By partnering with Schneider Electric, the County will be able to modernize several of its facilities and reduce its energy consumption by 35 percent. Schneider Electric worked closely with the County to develop a solution that will offer many long-term benefits such as improved facility efficiency, occupant comfort and financial management. The focus of the program is rebuilding and expanding the County’s downtown central chiller plant and upgrading building automation systems, both of which are well beyond useful life. As part of the new central chiller plant, the County will be expanding the central chiller plant connections to include additional facilities, providing a simpler, more efficient solution. The central chiller plant is set up to support future expansion needs as part of a strategic plan to ensure future needs are proactively managed in the most cost-efficient manner. In addition to providing critically needed equipment and systems to replace failing infrastructure, the program will deliver significant energy savings. Webb County officials are encouraging residents to participate in the County’s energy efficiency movement by downloading the online Community Sustainability Guide at http://seESS.co/aqmh. The guide provides tips on how to reduce energy use and waste at home, work and on the road. Construction is underway and is scheduled to be complete by the end of 2018. Over the past 25 years, Schneider Electric has successfully implemented more than 660 ESPC projects across the nation, saving its clients nearly $1.7 billion. This project delivery method helps publicly funded entities make capital improvements over longer payback periods and offers many long-term benefits such as improved facility efficiency, occupant comfort, financial management and environmental protection. For more information on how Schneider Electric helps cities and counties tackle their biggest energy efficiency challenges, please visit http://www.enable.schneider-electric.com or contact your local Schneider Electric representative.